Since open heart surgery Bekah’s appointments had been consistently scaling back, and we were to the point where they were every 6 months. At this past appointment, Dr. VandeKappelle (who, in case I forget to mention it, we LOVE!) told us that we had two choices–we could come back in 6 months and have an echocardiogram, or we could have one that day (providing our little patient would cooperate) and probably space appointments out to once a year. Now, I like seeing Dr. Vande Kappelle, mostly because it’s reassuring to hear that Bekah is doing fine every 6 months But I was also curious about what her echo would look like and I knew Bekah was being moderately well-behaved. I could not guarantee how she would do for the echo, but I also knew that if she had a meltdown we could always try again the next time. I really didn’t expect to hear good news or bad news. I expected to hear that everything looked the same as the last time–same residual patch leak (there is a leak around the patch that was sewn into her VSD because of the size of the hole, among other things), same everything else. 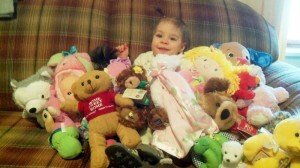 Bekah surrounded by her toys. And then the echo took longer than usual. Bekah started to get a little fidgety, and it kept going…I started to get a little nervous, and when Dr. Vande Kappelle appeared in the echo room, a little nervous turned into a LOT nervous. It’s hard to look at Bekah now and remember the tired, weak baby she was before surgery. Today she does everything that a “normal” 18 month-old does, and often more. As I helped her dress after the echo though, it was all I could think about. When Dr. Vande Kappelle came in to talk about the echo and ripped a piece of the paper off the exam table, I knew I was going to see a picture of what he saw in Bekah’s heart. It reminded me of the picture he drew when he first diagnosed Bekah’s heart defects at 2 days old, and it made me smile a little to see that he was drawing a MUCH better looking heart. We knew that it was possible that her heart muscle could grow around the patch and eventually close it, but we also knew that the pressure coming through the hole made a complete closure unlikely. The hole, as Dr. Vande Kappelle described (and drew) it, was much smaller than it had been and he wanted to make sure that was really what he was seeing before he told us about it. 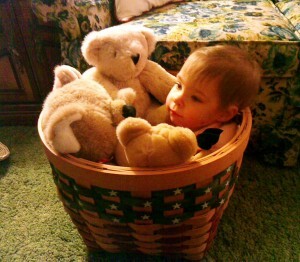 Bekah lounging in a basket. However, that wasn’t all he had seen. He also drew a small leak around a valve…something altogether new. It wasn’t a huge leak. In fact, it was rather small, tiny, hard to even identify for sure as a leak at all–something that, as long as it doesn’t continue to grow, she can easily live with–but it was still something new. I knew going into heart surgery that repairing the holes in Bekah’s heart did not mean that there would never be any other problems and that other things could appear as she grew and got older, but it still wasn’t easy to hear that there may be something, even something teeny tiny, wrong. So, we won’t be spacing our appointments out after all, and Bekah will be getting another echo at her appointment in September to see if anything has changed. And, that’s where I am right now…unsure of whether to be happy because a hole has closed a little…or to be worried that a new hole may have opened. But, mostly, I’m really just thankful for the silly and sweet little girl whose heart (the figurative one) seems like it gets bigger and more adventurous every day.